I did threaten to share my pantry organising with you, don’t say I didn’t warn you. 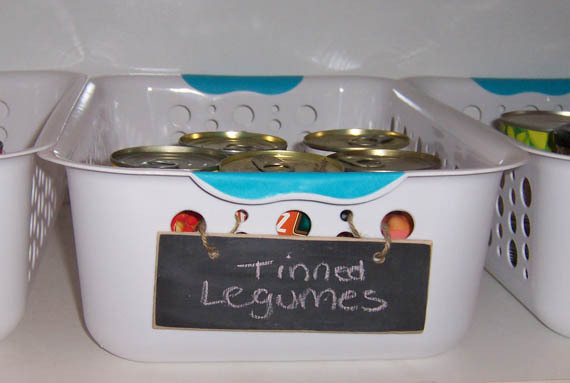 Thing is, I didn’t go with the whole mod podge up to my elbows recycling cardboard boxes to store tinned goods in. I have a collection of boxes I was going to make over into the rolling out type of can storage, but when push came to shove I just couldn’t start a project which would take forever the way things are going with projects around here. Of course walking through Kmart and finding these baskets for $3 and $4 respectively helped lubricate the shift from recycling boxes to just forking out some cash. 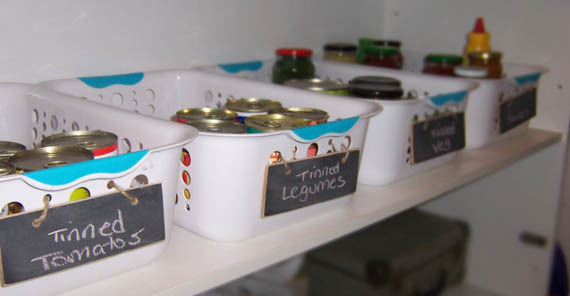 Of course I had to make labels for them, cause what pantry organisation is complete without labels? I had some leftover chalkboard from an earlier project… so risking my fingers I cut it down to small pieces using the circular saw (the jigsaw is broken – and I was careful, but I still don’t recommend it!). 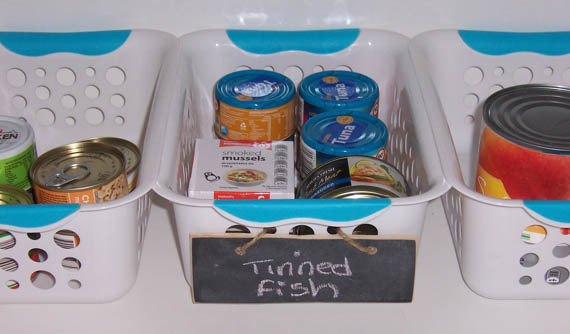 I then drilled holes into each piece, wrote on them and tied them to the baskets with jute string. I bought a few baskets in each size to see how they’d go, and I’m liking them. They’re not imaginative or pretty or perfect, but you know what? They work. I can look into the pantry now and know exactly what I have or how low I’m getting on something. And Wayne wont break his back searching for, and not finding, the baked beans, forcing me to get off the computer and go find them for him.